Assassination is usually defined as politically inspired murder. The term is probably derived from the Arabic word for hemp (Hashish), which was apparently used by Hasan-ban-Sabah (c. 1034–1124) to induce motivation in his followers. These "hashishins" or assassins were assigned to carry out political and other murders, usually at the cost of their own lives. Thus, at the etymological level, there is already a connection between assassination and compounds derived from nature. Biochemicals in the context of assassination involve mostly plant-derived drugs or toxins. They can be organic compounds such as alkaloids, diterpenes, cardiac and cynogenic glycosides, nitro-containing compounds, oxalates, resins, certain proteins and amino acids. A selection of these biochemicals were effectively used in assassination attempts throughout history. The ancient civilizations of the Near East, Greece and Rome developed the use of poisons in political homicide to a high degree of efficiency. In classical Rome, mushroom poisons were expertly administered by Agrippina ( A.D. 16– A.D. 59. ), wife of Emperor Claudius and mother of Nero. She successfully disposed of several political rivals, including Marcus Silanus who was to succeed Claudius, and eventually Claudius himself. Agrippina probably employed the properties of the amanita species, which contain amanitin polypeptides that produce degenerative changes in the liver, kidney, and cardiac muscles. In ancient Egypt, Queen Cleopatra in her search for a suitable suicide compound became familiar with the properties of henbane ( Hyoscyanus niger ) and belladonna ( Atropa belladonna ), although she judged death by these plants to be rapid, but painful. Cleopatra was also disappointed with Strychnos nux-vomita (a tree whose seeds yield strychnine). Strychnine causes stimulation of the central nervous system, produces generalized convulsions, and distorted facial features at death. The latter did not suit Cleopatra, who eventually settled for the bite of an asp (Egyptian cobra), which produced a more serene and prompt death worthy of a queen. 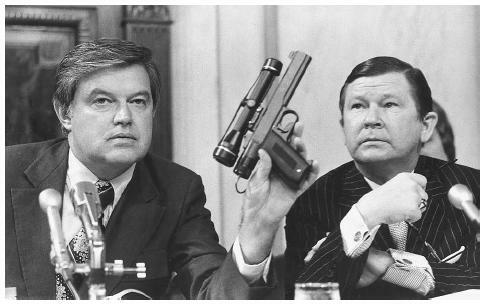 Senator Frank Church, left, chairman of the Senate Select Intelligence Committee, displays a poison dart gun as co-chairman Senator John Tower watches during the panel's probe of the activities of the Central Intelligence Agency in 1975.
it was most probably a mixture of naturally derived copper, arsenic and crude phosphorus. In later times, cyanide became more widely used as a homicidal poison. Today, cyanide is usually derived in large quantities from industry, but it has its source in biochemical processes involving cyanogenic glycosides. Amygdalin is one of the most widely distributed glycosides, yielding hydrocyanic acid (HCN) as a product of hydrolysis. It is present in the rosaceae plant family and found in the seeds of apples, cherries, peaches and plums. HCN inhibits the action of the enzyme cytochrome oxidase and prevents the uptake of oxygen by cells. As little as 0.06 g can cause death in humans. Consumption of a lethal dose of HCN is usually followed by collapse and death within seconds. As an assassination weapon, it was famously employed in the killing of the Russian monk Gregory Efimovich Rasputin (c.1872–1916). Legend has it that Rasputin's unnaturally strong constitution allowed him to ingest enough cyanide to kill six men, yet he continued to breathe and eventually received his coup de grace from a gun shot. Ricin is a political poison of twentieth-century origin. It is found in the shell casing of castor beans and is easily produced, thus having the potential to be a large-scale murder weapon. Ricin came to public attention in 1978 when it was used in the assassination of Bulgarian dissenter Georgi Markov in the United Kingdom. Markov worked as a broadcaster for the British Broadcasting Corporation, and relayed pro-Western material to his communist homeland. Markov died several days after being jabbed by an umbrella at a bridge in London. The poison-tipped umbrella injector was designed by the Soviet intelligence agency KGB, whose Bulgarian agent carried the umbrella and delivered the Ricin to the victim. An autopsy revealed that a platinum-iridium pellet the size of a pinhead had been implanted in Markov at the site of his injury. The pellet was cross-drilled with 0.016-inch holes to contain the Ricin. A short time earlier, a similar attempt had been made in Paris against another Bulgarian defector, Vladimir Kostov. This attempt proved unsuccessful because his heavy clothing prevented the steel ball from entering any farther than his subcutaneous tissue. Kostov read of his comrade's death and went for a medical examination during which the pellet was found and removed before any of the toxin could be absorbed. Ricin is an extremely toxic poison. It is estimated that Markov was killed by only a 425 mg. dose contained in the pellet. Ricin is deadly because it can be inhaled, ingested or swallowed and is quickly broken down in the body and is virtually undetectable. Markov's assassination was only detected because the pellet carrying the poison had not dissolved as expected. There is currently no antidote to Ricin although a vaccine has been developed that has been successfully tested in mice. Apart from the poison pellet umbrella, the KGB is known to have designed several other imaginative devises to deliver biochemical poisons. One was a pen-sized assassination weapon that could deliver gas or liquid poisons. Another was a cigarette case, surrendered by KGB assassin Nikolai Khokhlov upon his defection to West Germany in 1954. The device could fire poison filled hollow-point bullets through the false cigarettes at the opening of the case. Khokhlov, who had been sent to assassinate anti-Soviet émigré Georgi Sergeyevich Okolovich, defected rather than carry out his mission. In the 1950s and 1960s, a talented chemist and poisons expert worked for the United States Central Intelligence Agency (CIA). He was Sidney Gottlieb (1918–) and also operated under the name Joseph Scheider. In the 1960s, Gottlieb was involved in various chemical and biochemical projects, none of which was apparently successful. Gottlieb created devises that could deliver poisons by which the CIA could carry out assassinations of political leaders who were assumed to be a threat to U.S. national security. One of these leaders was Fidel Castro, whose liking for Havana cigars was considered to be a possible means of administering poison pellets. Gottlieb is thought to have inserted poison into Havana cigars that were sent to Castro, but which were somehow intercepted and never arrived. Gottlieb then tried to create a poisoned wetsuit, which Castro never wore. Another assassination attempt involving Gottlieb was planned by the CIA on General Abdul Karim Kassem of Iraq by planting a poisoned handkerchief in his suit pocket, but this plan also failed. Gottlieb adopted a slightly different tactic in the planned assassination of African leader Patrice Lumumba, the leftwing prime minster of the Congo (now Zaire). In September 1960, he constructed an assassination package that included a biological agent able to induce tularemia (rabbit fever), brucelloisis (undulant fever), anthrax, smallpox, tuberculosis and Venezuelan equine encephalitis (sleeping sickness). This agent was mixed with toothpaste and placed in a tube that could be slipped into Lumumba's traveling kit. Gottlieb delivered this package to Lawrence Devlin, the CIA station chief, instructing him to kill Lumumba. However, the operation also did not achieve its aim, as Lumumba's enemies in the Congo murdered him first in January, 1961. Klaassen, C. D. Toxicology: The Basic Science of Poisons. McGraw-Hill Companies, 2001. Benomran, F. A., and J. D. Henry. "Homicide by strychnine poisoning." Med Sci Law 36 (1996): 271–3. Dally, S. [Non-accidental criminal poisonings] Rev Prat 50 (2000): 407. Knight, B. "Ricin—A Potent Homicidal Poison." Br Med J. 1 (1979): 350–1. Zhan, J., and P. Zhou. "A Simplified Method to Evaluate the Acute Toxicity of Ricin and Ricinus Agglutinin." Toxicology 186 (2003): 119–23.